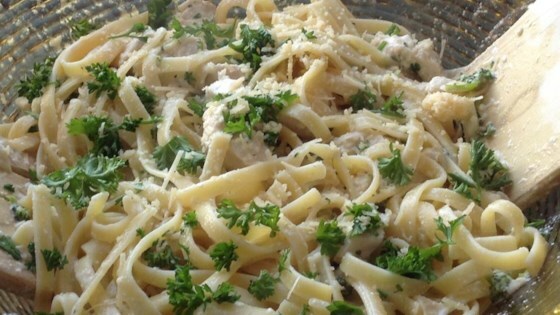 "This version of chicken fettuccine alfredo is lightened by substituting some of the heavy cream with chicken broth." This recipe is a pretty good version of alfredo, but should not be called light just because a little heavy cream is replaced by chicken broth. This was a tasty dish. However, I can't reconcile the calories and fat with my current dietary requirements of a low fat diet, so I will not make it again. Excellent recipe Chef John! Made this for dinner and my spouse loved it. Thanks for sharing. Yummy. Easy to make and very delicious. Thanks for sharing.